Lancashire County Council have advised residents that all priority routes will be treated this evening. Gritters will be out in force in Central and South Lancashire as temperatures look set to drop to 0.5 degrees Centigrade overnight. Drivers have been asked to take care on untreated roads as "ice is likely on untreated surfaces." A spokesman for Lancashire County Council said: "All priority routes in Central and South Lancashire to be gritted this evening. "We have weather predictions of snow/ice and temperatures reaching minus 0.5 deg C. We will apply salt to all priority routes. 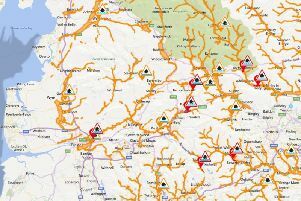 "Priority routes only cover a third of the highway network and ice patches can develop on treated surfaces caused by water run-off from fields or other sources. Ice is most likely on untreated surfaces."